Traffic comes barreling down Ninth at Periwinkle Plaza, but you can barely see it. On Monday and Tuesday, Albany city employees plan to sweep the town of temporary signs placed in the right of way along major streets. Some of us think those signs, most of them little A-frames, are less of an annoyance than the landscaping on many corners that keeps us from seeing what’s coming down the street. The sign removal is an occasional operation prompted first of all by the city code, which bars private signs in the public right of way, and secondly by concerns that the signs obscure the sight lines of drivers. Those sign boards could be the indirect cause of crashes. But I think that latter concern is mostly theoretical. I can’t recall an instance where a sign kept me from getting a good look at traffic coming down the street. Far more often, especially downtown, it is cars and especially pickups and vans parked on the curb that keep me from seeing more than a few feet down the streets to my left and right. And then there’s landscaping that’s blocking the view. On most business lots, landscaping is required by the city’s development code. And maybe the code says something about plantings having to be low so drivers can see above them. The trouble is that plants grow, and sometimes they grow taller than is good for convenience and traffic safety. 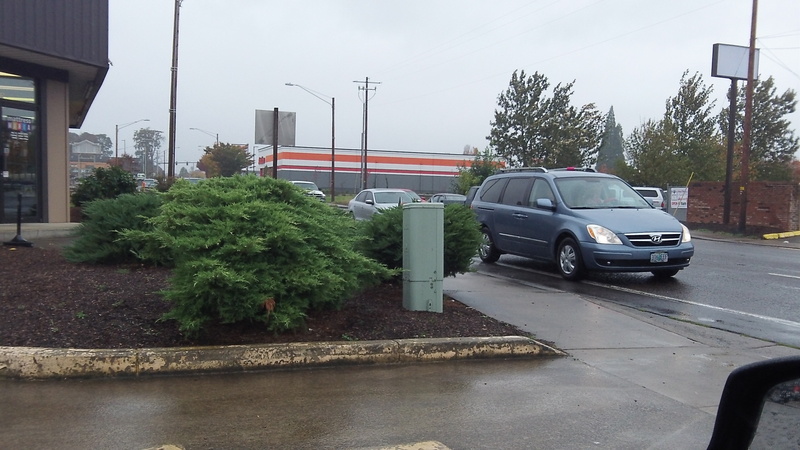 I wish ODOT would pull all of their plants out of their right of way at Ninth and Ellsworth. All of that is too tall to see over when in a compact car, or a low luxury car. It’s been too tall practically from inception. Article 13 (Signs) of the Albany Development Code contains 21 pages of regulations that have the force of law enforced by a Code Enforcement Team. is this watching out for the public interest, or government control run amok? You decide. There is an ordinance covering sight line at intersections which calls for the trimming of tall grass, shrubs, and fences must be short enough to see over. Logically, one would think that this would also apply to driveways. If no one is specifically assigned to report these things it won’t get done. It’s that old “it’s not my job” attitude. I for one am glad there is not a city employee whose jobs is to take a yard stick to fences around the town. Ordinances are not black-and-white. They are there to enforce a rule if need be, if something causes a problem. Discretion in application of ordinances and laws is a good thing. It’s not an ‘it’s not my job issue’. If there is a problem, and you report it to the city, I expect they will take a look. If not, then there is room to complain. But the city should not have ‘someone assigned to report these things’. That would be a waste of resources, and bad for the community as well.